I am a sucker for ‘different’. Anything out of the box catches my fancy. I believe, that to stand out in the crowd, you ought to have the chutzpah, that zing, the X factor. And hence whenever I have found something to be a novelty, I have gone clickety click, much to the embarrassment of the family. The humble auto rickshaw is the lifeline, particularly, of the city of Mumbai. I have known its value only when I have stepped out of my city. This three-legged creature scurries around the crowded streets of the metro, ferrying passengers to and fro. We might think they are the bane of our existence and add to the traffic woes, but for people like me they are manna from heaven. You see, I don’t drive, even though I know how to. And taking the public transport does not really work out that well either. Cabs don’t ply freely in my part of town. And so, these fellas are all I depend on. As much as I hate their attitude, I rely on them for my day-to-day commute. And hence when I came across this piece of art at the Mumbai International airport, I realized nothing resonated more with the spirit of the city, especially the suburbs. 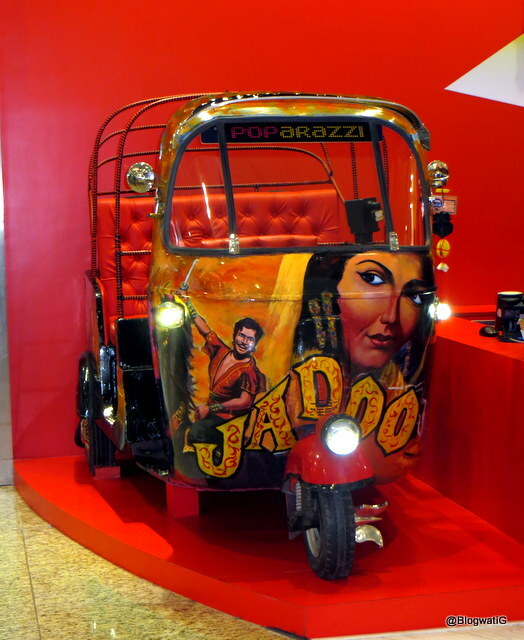 The auto rickshaws are synonymous with Mumbai and its traffic. But have you seen anything like this yet?